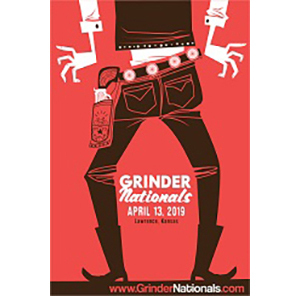 Troy Farrar is one of the people behind the new Grinder Nationals, set to go off on Saturday, June 24, 2017 in Lawrence, Kansas. Troy joins the podcast to discuss the new race, the intentions behind it, and the goal of this year and the event going forward. Troy also shares his long history in the world of directing endurance sports events and how that has brought him to this point. Troy is also an important member of the United States Endurance Cycling Federation and he gives listeners information about what they do and who they are. If you’re looking to add a little more competition to your summer while on gravel, be sure to have a listen. If you have any questions, comments, or have an idea for an episode, please feel free to contact us anytime. It’s time for some Gravel Grinding and Lawrence, Kansas is the place! There is a category for everyone from high school to those who are a little longer in the tooth and all who register for the USECF Gravel Grinder National Championship will race for a coveted USECF National Champion Jersey! See what you are made of as you race across a challenging & scenic course as part of the 2017 USECF National Championship Weekend. The USECF Gravel Grinder National Championship will be part of the weekend festivities which include an epic course, great food and a fun & festive award ceremony. The awesome course and time in the saddle with the gravel tribe will make this an epic event to remember. The USECF is a group of grassroots racers that have been producing and racing in off road endurance cycling events for over 25 years. The USECF will aid race directors by providing inexpensive event insurance with no participant membership or license fees, a database of race director resources and free consulting to assist race directors in producing successful events. The USECF wants to celebrate off road endurance cyclist’s hard work, dedication and love of endurance cycling by producing endurance cycling national championships. These championships will provide the opportunity for endurance cyclist to compete against other racers from around the country and will recognize & reward the top competitor’s efforts with national champion jerseys. The mission of the USECF is to support the positive growth of endurance cycling events at the grassroots level. Grinder Nationals Website Grinder Nationals Event Page on Riding Gravel Contact Grinder Nationals United States Endurance Cycling Federation Discuss the Grinder Nationals on the thread on the Riding Gravel Forum Guitar Ted’s Blog The Riding Gravel Tire Finder Riding Gravel Event Calendar Riding Gravel Forum Riding Gravel Bike Finder Riding Gravel Tire Finder Interested in sponsoring an episode? Contact us.